Claire Pottinger-Schmidt was born in Québec, Canada and lives in Austria since 1997. She graduated from the University in Toronto (violoncello and conducting). 1990 she moved to Europe to continue her studies in Basel at the Scola Cantorum Basiliensis with Jordi Savall and Paolo Pandolfo (viola da gamba), Christophe Coin (baroque cello) and Jesper Christensen and Johann Sonnleitner (chambermusic). She did several recordings with Ars Antiqua Austria, Concerto Tivoli, Akademie für Alte Musik Berlin, Ensemble 315, moderntimes and some other. Since 1997 she is teaching viola da gamba, baroque cello and historical tuning at the Anton Bruckner Privatuniversität Linz and since 2005 at the J. J. Fux Landeskonservatorium Graz. 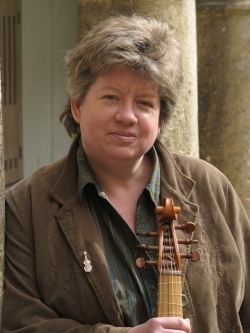 Claire Pottinger is the leader of the Lentia Consort with focus on music for viola da gamba from the 16th and 17th century. She is well known as a teacher as well as a freelance musician and specialist for continuo playing.